Made this for dinner tonight and it was delicious! I loved the addition of refried beans and avocados. I used a fiesta cheese blend and a mexican cheese blend (ran out of the former), but it still worked well in place of mozzarella. This recipe definitely needs some tweaking though – add more taco seasoning or more salt. It was a little bland, but more salt would’ve enhanced the flavor. I did use a low sodium taco seasoning, so that may have contributed to the blandness?? Regardless, taste test and adjust to your liking. Also, instead of baking it in the oven, I’d heat it in a pan to get that nice color on the tortillas. Heat olive oil in a medium skillet over medium high heat. Add ground beef and cook until browned, about 3-5 minutes, making sure to crumble the beef as it cooks. Drain excess fat and stir in taco seasoning and green chiles; set aside. 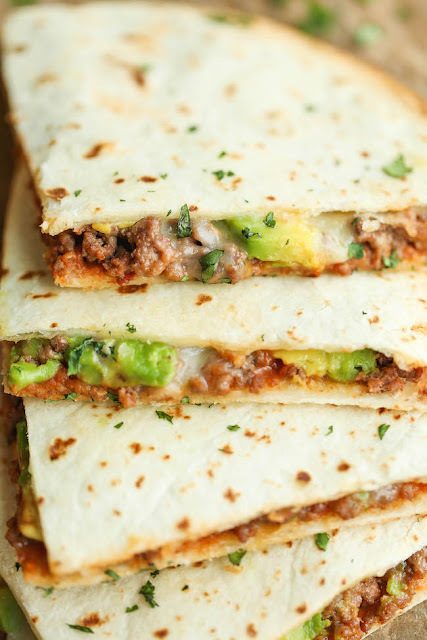 Top tortilla with refried beans, ground beef mixture, avocado and mozzarella, and then top with another tortilla. Repeat with remaining tortillas to make 4 quesadillas. Serve immediately, garnished with cilantro, if desired.